It finally happened. 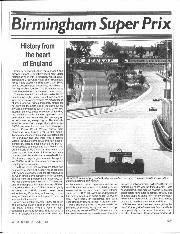 After years of effort and disappointment, Birmingham had its race. 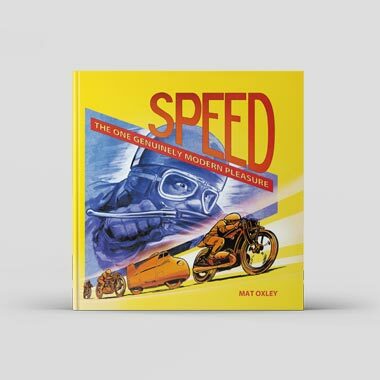 Motor racing has been with us for ninety years but we, in mainland Britain, had never before been able to see it take place on the streets of a city. Some events become great occasions, regardless of the degree of competition. The Birmingham race has the ingredients to become such an occasion. The area in which the track was laid out is not an attractive sight, being one of those areas of inner city decay going through the slow process of urban renewal. Armco and safety netting did not enhance the aesthetics of the place but the city was determined to put on a good show. The layout of the circuit was, of course, dictated by the available roads but the organisers, with enthusiastic local cooperation, had done a good job of squeezing everything in. 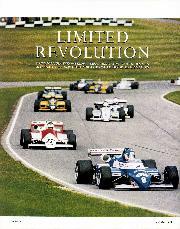 The markets acted as the support race paddock while all the F3000 cars were housed in a covered car park behind Bristol Street Motors whose main showroom was turned over to the media. Temporary hospitality boxes were erected near the start/finish line and there was a "tented village" in which teams could entertain guests. Temporary bridges supplemented the permanent subways so crossing to the infield was no problem and since the crowd was accommodated around the whole 2.7 miles and were much closer to the action than at any other British circuit, everyone got a good view and the sight of an F3000 car at full chat a few feet away is a mightily impressive one. The Consultants to the organisers, MCD, had suggested a couple of support races together with demonstrations to keep the crowd amused between times, demonstrations which could be deleted from the programme if necessary, but we had a pro/celebrity Renault 5 Turbo event, and Thundersports, Formula Libre and FF1600 to accommodate. A lot of drivers who had gladly supported an historic occasion went home without racing. Organising motor racing is not as easy as the experts make it appear to be every weekend of the season. 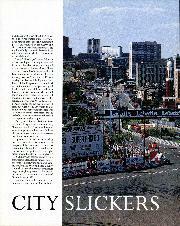 After a hesitant first season, F3000 has taken off but now we are in a position where there are too many entries. When a race is oversubscribed, as many have been this year, you're left with disappointed drivers and teams with explanations to make to sponsors and the net result is a certain amount of instability. A few weeks before the race, teams were offering spare drives at £25,000. As the race drew closer, this had dropped to, in some cases, £5,000 or less. That's hardly an economical rate but it keeps the cash flowing, at least in the short term. It would be premature to be too pessimistic but the entry of 34 cars, though an over-subscription, was the lowest in F3000 this year and the fact that there were only three types of chassis in the race, is not a good sign. Dallest's AGS did not materialise, there was no Minardi entry, RAM has withdrawn, and mooted chassis from other constructors have failed to appear. If F3000 is to be a real stepping stone to F1 for anyone apart from drivers, there should be a little more variety on the grid than Marches, Lolas and Ralts. Of the three, none has clearly emerged as the car of "86, though the Pavesi team's private Ralts have generally embarrassed the works Ralt-Hondas, the only non-Cosworth powered cars to have appeared in the formula. Practice was scheduled to begin at 9.00am on the Sunday morning but it was discovered that there were bolts missing from the Armco and it was nearly three hours before the first car went out. That delay put the entire schedule out of joint as well as attracting the wrong sort of publicity, via radio news bulletins, for the city and the race. Once out, the drivers found themselves with mixed feelings. The general concensus was that it was a demanding, bumpy circuit but those with the right attitude saw it as a challenge to their craft and on the whole approved. 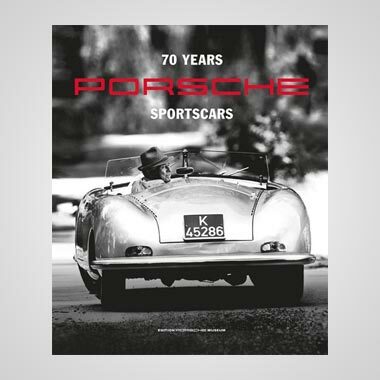 Among the drivers were a number who had taken one-off deals, like Ross Cheever, Tim Davies, Dave Scott, Tommy Byrne and French hillclimb champion, Marcel Tarres. There was the usual game of musical chairs as well, Eliseo Salazar, redundant after RAM's withdrawal, slotted into a works Lola while Alain Ferté moved over to an Oreca March. He damaged this in practice but the team hired another March for the race from a non-qualifier. Because of the number of entries and the constraints of the circuit, drivers were divided into two qualifying groups and the grid decided by having each side line up behind the fastest man in the grid. This led to some anomalies. The commentators would insist, for example, that Andrew Gilbert-Scott (Lola) was the third quickest in qualifying though in fact he was eighth quickest but third on the grid. 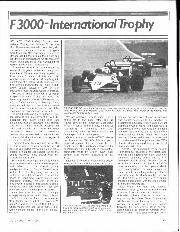 This was because he was second quickest in his group and since the fastest man, Pierluigi Martini (Ralt) also set pole, Gilbert-Scott lined up behind him alongside Michel Ferté (March) who was second to Luis Sala (Ralt) in his group but who had actually set a better qualifying time than Gilbert-Scott. This is not to detract from a fine performance by the young Englishman who, for financial reasons was having perhaps his last chance to prove himself in the formula. From fifth place down, the grid read: Pascal Fabre, winner of the International Trophy (Lola), Elisio Salazar (Lola), John Jones, quickest in Sunday's untimed session (March), John Nielsen (Ralt-Honda), Thomas Kaiser (Lola), Emanuele Pirro (March), Tommy Byrne, the quickest of the debutants (March), Ivan Capelli, the Championship leader (March), Satouro Nakajima, who replaces Dumfries at Lotus next year (Ralt-Honda) and in 14th place from 26 on the grid, Mauricio Gugelmin, whom Ayrton Senna tried to get into the Lotus team this year (March). One and a half seconds covered those mentioned and Martini's pole time of 1min 22.16sec translated into an average speed of 108.22 mph. Things looked promising indeed for the Monday. Monday dawned windy and overcast, but dry. Hurricane Charley, however, had decided that Britain was a good place to blow out in style and made no exception for Birmingham. The morning warm-up was dry, but then the heavens opened. The "celebrity" half of the paired "pro/celebrity" Renault 5 Turbo race went out, practised, and ran their five laps but then the schedule was interrupted to allow the F3000 runners out for a 20 minute acclimatisation session which was interrupted when Tarres had a spin. By now the time table was in shreds, the second part of the Renault race was postponed and 30 laps of the Thundersports cancelled. Still, FISA rules and common sense state that F3000 has priority and, besides, there were the television cameras to consider. 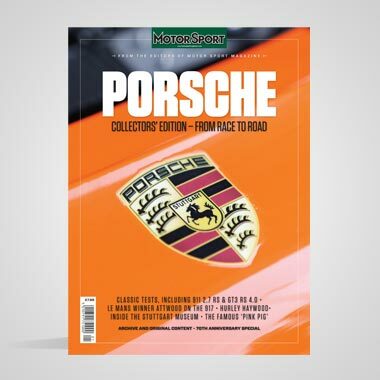 All 26 starters made the grid on schedule and though some later said the race should never have been run, none elected to pull out and races have been held in equally wet conditions, though the track surface appeared to retain water more than, say, the special surface at Silverstone. Then the start lights failed, due to being flooded, which is as well for a couple of cars had stalled on the grid and the conditions were bad enough without additional "chicanes". Five minutes went by and the race itself began on a flag. Martini took an immediate lead from his team mate Sala. Nielsen stalled on the line and Pirro had his work cut out to avoid him. Capelli overtook six cars after the first three corners then spun and damaged his car, while Russell Spence moved from 18th to eighth on the first lap and up to sixth by lap five! Sala was clearly quicker than Martini and was in the lead by the end of lap one followed by Martini, Michel Ferté, Andrew Gilbert-Scott (whose car was set up much too stiffly for the conditions), Pascal Fabre, Eliseo Salazar and John Jones. Visibility though, was appalling, Tim Davies later said he couldn't see the barriers along the straight, let alone flags or the red lights of a car in front. It was not too long before the track was littered with abandoned cars but at the front, Sala was pulling out a steady lead though it was not without some discomfort. First he was nearly taken off by Tarres staggering back to his pits with a deranged car on lap three, then he had a quick spin on lap 10 which took off his nose cone but not the front wings. So he then had to drive with soaking wet and freezing feet, though to watch him you'd think there was nothing amiss as he continued the process of extending his lead while lapping the backmarkers. Fifteen seconds behind, Martini was being threatened by Ferté, then came Salazar, and a long gap before Fabre and Spence hove into view. Gilbert-Scott had slipped steadily down the field then came into the pits for suspension adjustments which eased matters. Just out of the points was Jones followed by Nakajima, Kaiser, Pirro and Moreno with Nielsen way down but charging after his mis-start, a drive which was to bring him up to Moreno by the end. The race, in fact, finished in that order, but without Pirro who had an accident on lap 14. The rest of the story is easily told. Sala sustained another quick spin on lap 22, but recovered and kept his lead, though reduced to around three seconds. Despite his minor indiscretions, he drove beautifully under dreadful conditions and emerges as the most promising driver to come out of Spain for years. On lap 25, Gilbert-Scott spun and it would have been a harmless moment except that he collected Alain Ferté's abandoned March. With the cars blocking the track the race was halted. It took some time to decide whether to abandon it, during which interval everyone said his twopennyworth about the conditions. Finally, to everybody's relief, came word that it was all over, the positions at the end of lap 24 stood as the result and half points would be awarded, as at Silverstone. Fastest lap went to Salazar in 1min 42.62sec, 86.4 mph, an excellent showing for someone in an unfamiliar car, while Sala 's race average was 83.78 mph. Capelli still maintains his Championship lead (33pts) but Martini (27pts) and Sala (22.5 pts) have closed the gap and the series most realistically go to one of these three drivers. To round off the day, the second part of the Renault race was run but the FF1600 and F. Libre drivers joined the Thundersports men in going home without a race. Given all the circumstances, it's hard see what other decision the organisers could have made. Despite it all however, history had still been made and, no doubt, a few lessons learned. This writer will certainly be back next year — M.L. 1. Luis Salo (Ralt RT20/86 Cosworth) -- 42 miles, 24min 40sec, 87.87mph. 2. Pierluigi Martini (Ralt RT20/86 Cosworth) -- 42min 27.72sec. 3. 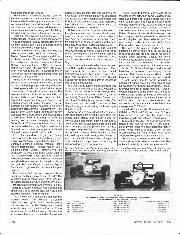 Michel Ferté (March 86B/Cosworth) -- 42min 29.70sec. 4. Eliseo Salazar (Lola T86/50 Cosworth) -- 42min 37.63sec. 5. 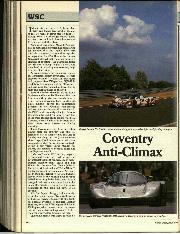 Pascal Fabre (Lola T86/Cosworth) -- 43min 07.83sec. 6. 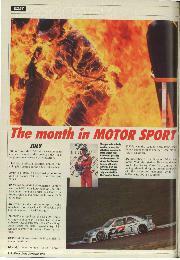 Russell Spence(March86B/Cosworth) -- 43min 20.19sec.